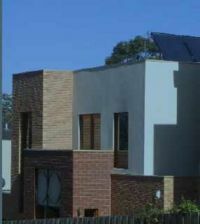 The JECO showhouse is a family home built in 2006 in Camberwell It is a detached house on a small site with 11 others. The site was purchased with planning permission and little scope to externally alter it. It does not have optimum orientation or design, with flat roof, no windows in the Northfacing wall, and no overhanging eaves. Never the less, it is rated at 32 points, equivalent to 7 stars. This was achieved within a cost limit of around 5% above the cost for the 5 star minimum currently required. The JECO Showhouse is open for tours. Residents of Australia, (performing such insulation energy improvements) may be eligible to take advantage of the current Australian Government Insulation Grant program. Approved insulation installers can perform installation at a heavily subsidised costs. This page was last modified 03:08, 12 October 2009.